Because we live so far from everything (10 miles to the post office to get our mail, 17 miles to an itty bitty library, 40 miles to a big supermarket, 90 miles to Lowe's), unless it's an emergency, we never leave the farm for just one thing. During today's seven hour outing we made 11 stops, which was actually on the low side (and we only forgot three four things!). We never travel without snacks, sandwiches, jugs of water, and emergency miniature candy bars. The chickens, on the other hand (foot? 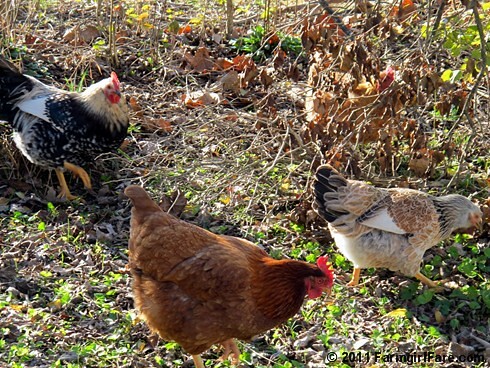 ), just have to look down and peck for their lunch—though of course they also never have to leave the farm. Lucky clucks. © FarmgirlFare.com, always glad to be back home sweet home. My grandparents' use to live in an area like that, where they had to drive far to get anywhere. My husband, not being used to it, had a hard time getting the fact that we couldn't just pop into a McD's on the way there. We did eventually find a Subway, probably the only fastfood for miles. :) I love the picture of your chickens. We can't own any where we live. Hoping one day to move to an area where we can.